A group of houses on an equestrian property near Condom in the French department of Gers - character properties France - in South-West, Perigord, Dordogne, Quercy, Limousin - Patrice Besse Castles and Mansions of France is a Paris based real-estate agency specialised in the sale of Character houses. 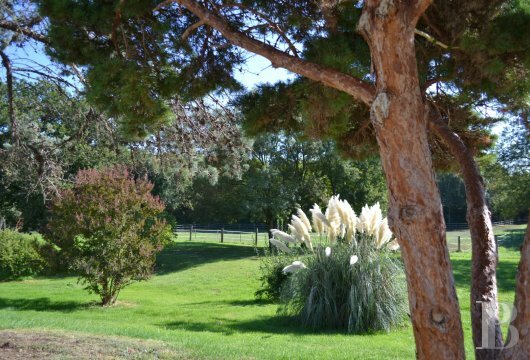 Less than 10 km from Condom, where the borders of three French departments, Gers, Landes and Lot-et-Garonne, meet and the landscape is still that of the Armagnac region. 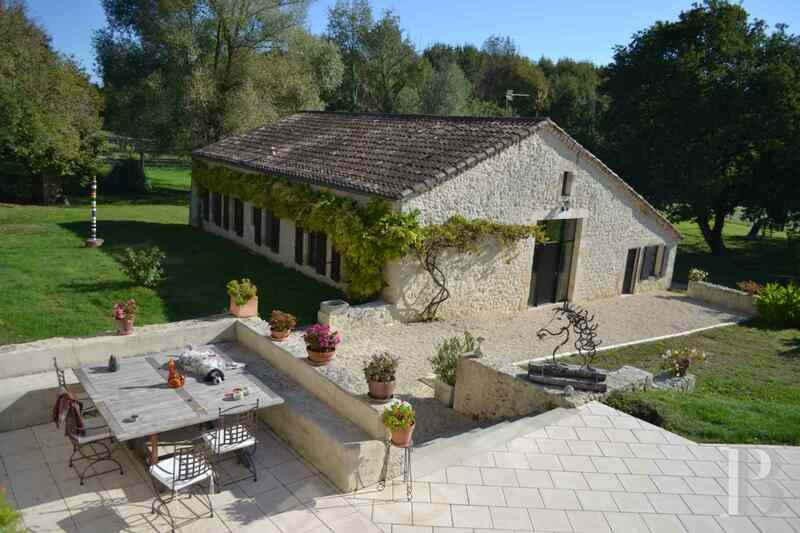 This property is an hour’s drive from the Bordeaux-Toulouse motorway and from Agen with its flights to Orly as well as its TGV trains taking 190 minutes to reach Paris. This property is set in a region of Gers with a wealth of bastide or fortified towns, such as Fourcès with its circular layout, and picturesque villages, such as Laressingle with its ramparts. 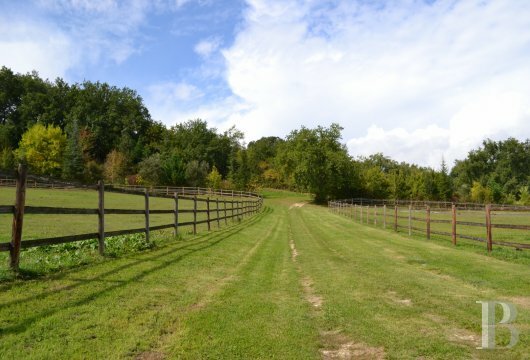 Devoted to the raising of horses and the equestrian art, it appeals courtesy of the quality and modernity of its restoration works carried out on both the house and the farm buildings. 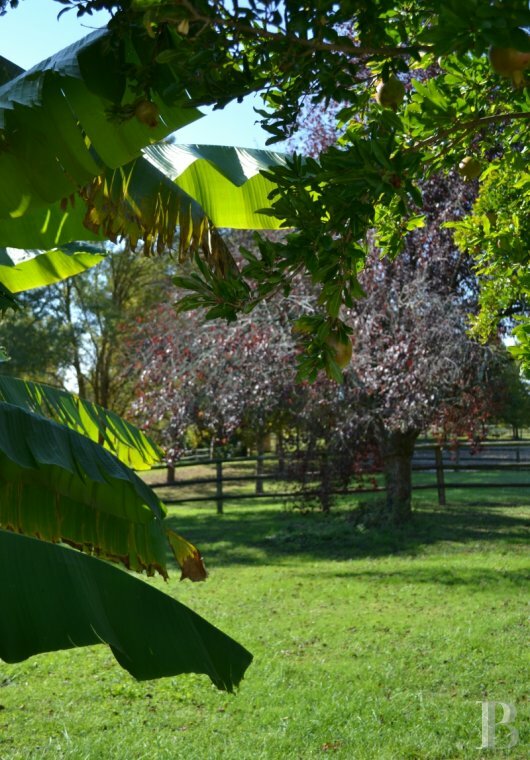 All around is unspoilt countryside with fields enclosed by wooden rails. 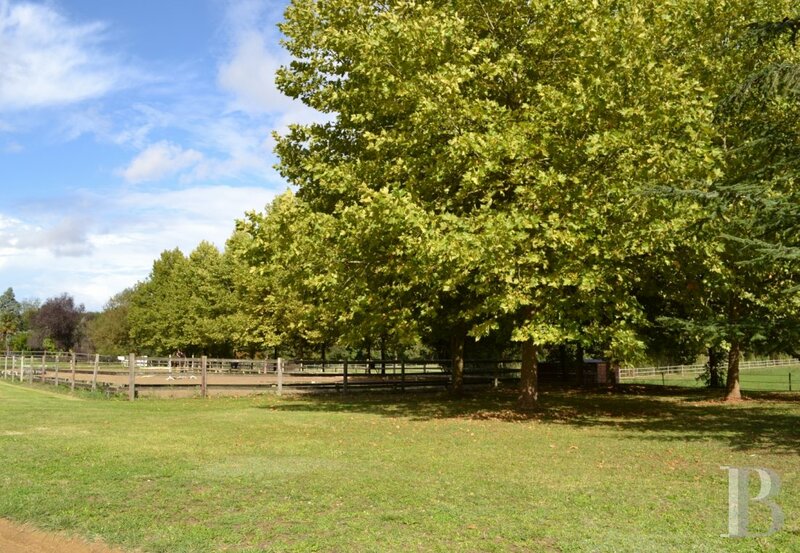 This estate has been planted with no less than four thousand deciduous trees. 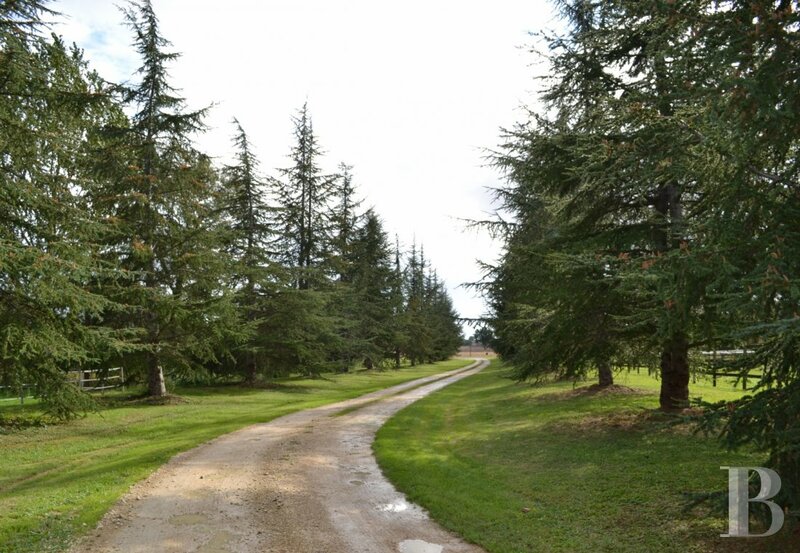 A cedar tree lined lane leads to the property where horses graze peacefully in the meadows. 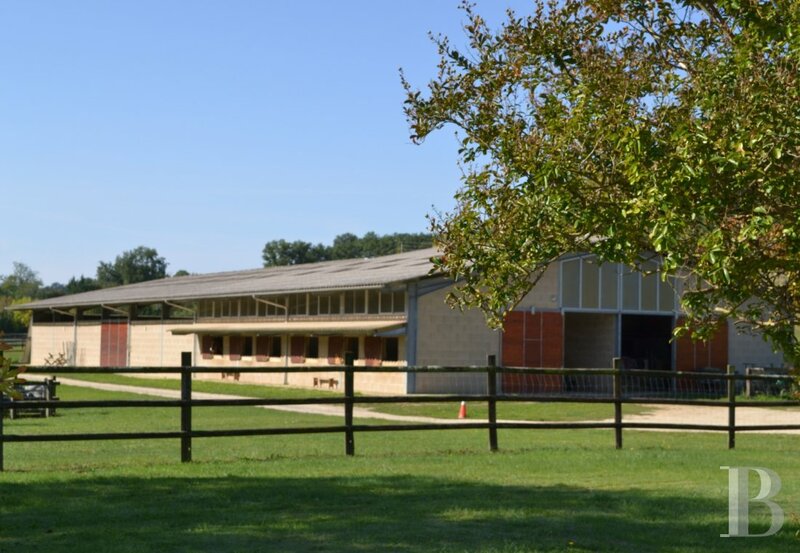 Here, visitors find a world given over to horses with a large covered riding arena, extended by horse loose boxes, and a dressage ring. The main house, constructed from large quarry blocks of light-coloured stone, extends to the south and to the north. Its long, west-facing facade, with its small windows, looks out over the access lane and its plateau-pruned hedge of plane trees. The east-facing facade looks out over the immense L-shaped swimming pool, from which it is separated by a large paved deck. The white walls, the tall French windows and the clear water give this spot an almost Californian air. The back door, for everyday use, is at the north end of the long building. 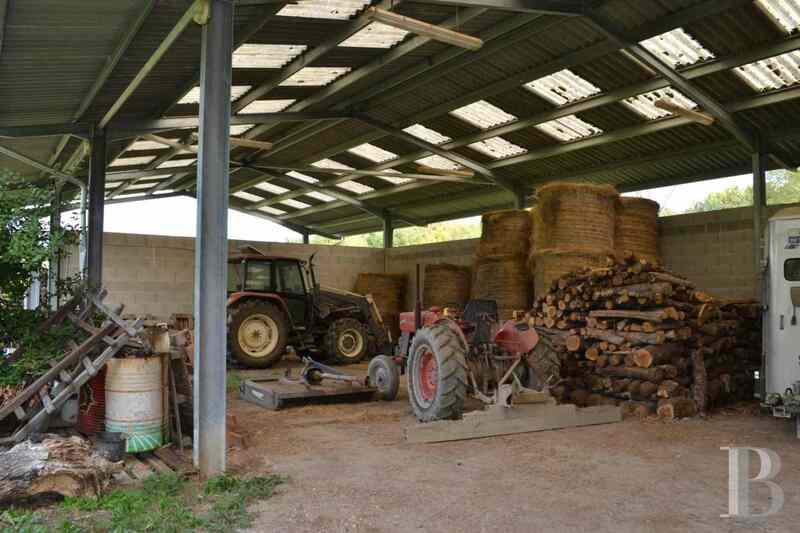 It is separated from the garages by a cement terrace which is extremely practical when unloading shopping! A storeroom, where shopping can be stored, and an adjoining laundry room, where the electric fuse boxes are housed, face this door. This section has polished concrete floors. A few steps lead to a kitchen with white floor tiles and white-painted, exposed ceiling joists. It is illuminated on the north side by two long, low windows and, on the east side, by double French windows, only the top of which is glazed; an efficient system for keeping animals outside. This extremely bright room has a Scandinavian touch. A small, adjoining dining room has a fireplace, fitted with a hatch, which is intended for grilling meat during the winter months. It precedes a hall, housing the stairway providing access upstairs to the bedrooms. Under the stairs is a small cloakroom and toilet. The stairwell is closed off by a mobile wooden lattice partition forming a light and airy separation behind the wrought iron railings. The floor is made of polished concrete. 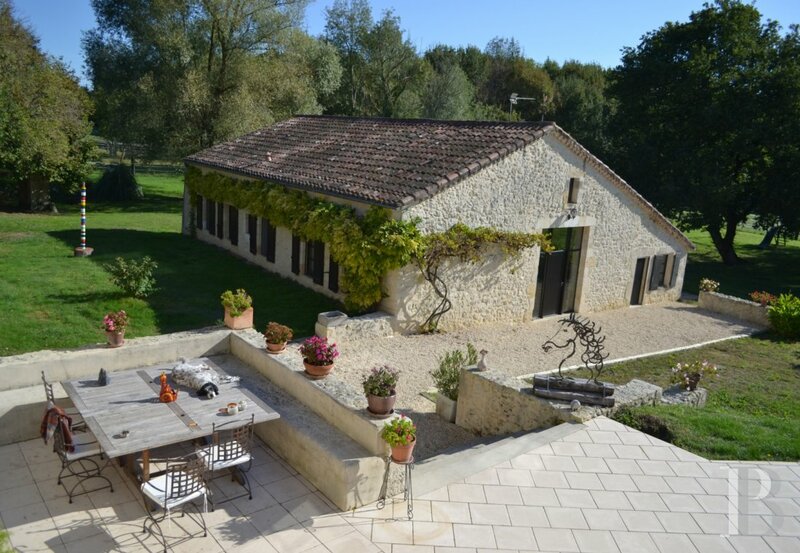 Continuing southwards, an area, enhanced with a bar, opens on to the swimming pool via a large basket handle arched French window. The walls feature bare stone, the floor is made of polished concrete and the ceiling has dark brown exposed joists. On the north side is a bar, set at an angle, with its sink. At the end on the west side, a stone archway provides access to a billiards’ room, reached via a few wooden steps. The floor is covered with strip pattern parquet flooring. The walls are lined with plasterboard; two walls are painted an old red, accentuating the masculinity of this room. A long, old-fashioned style bench, covered in leather, is set against the south wall. 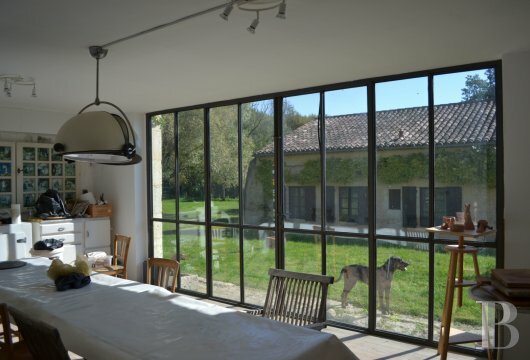 This room leads, north, to a study, with a polished concrete floor and exposed dark wood beams. Double French windows open on the west side on to the entrance lane. This area could become the large entrance hall for a function section, thus compensating for the limited size of the current entrance hall. Double, polished wood doors in the bar open into a large lounge, running the full width of the house. 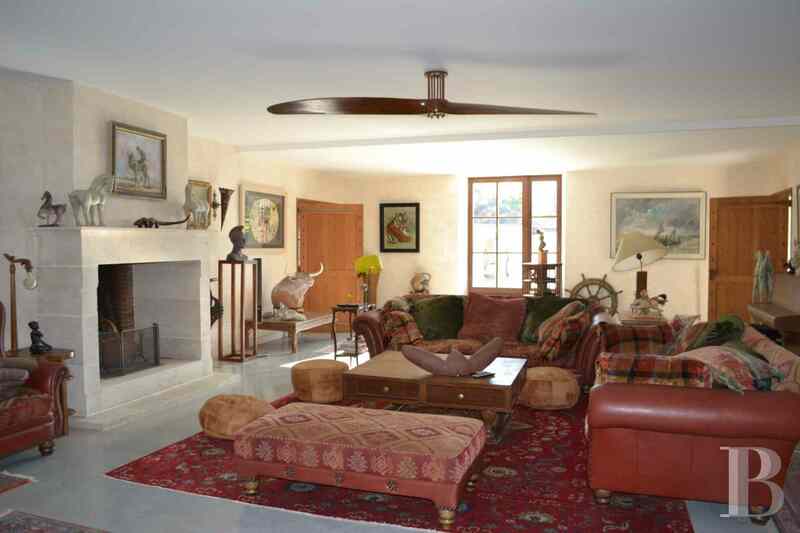 The ceiling is plastered and the walls are stress painted in a light ivory hue. It has a polished concrete floor. 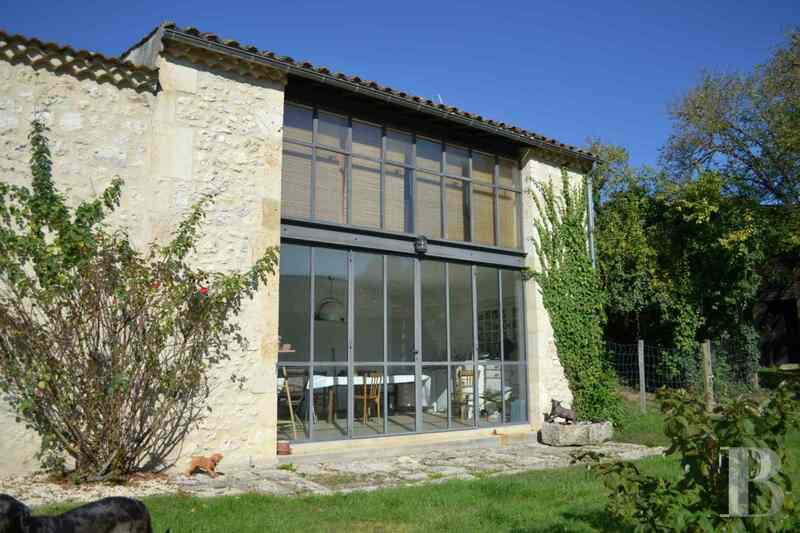 A floor-to-ceiling French window on the east side opens on to the swimming pool. Opposite on the west side, two small, low windows have a view of the entrance lane and the row of hedge-trimmed plane trees bordering it. The tall fireplace is made of white-painted stone. A wide alcove in the wall on the south side bears witness to a former basket handle arched passageway. 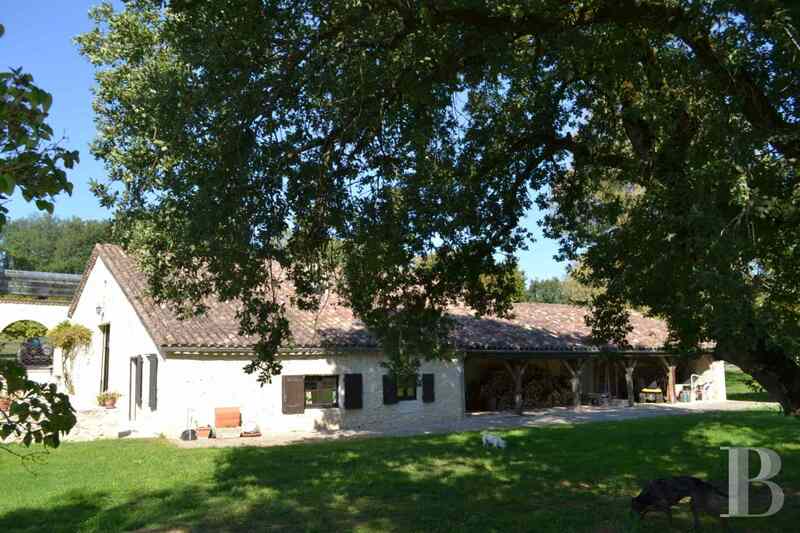 This is followed, at the very end of the house under the slope of the roof, by a large, extremely bright room with two tall, workshop style French windows which open, one, on to the swimming pool and, the other, on to the stables and the meadows forming a corral. This room has a polished concrete floor, white walls and a ceiling lined with dark wood panelling. A dividing wall on the west side is painted a rust colour. On the left-hand side, extending the rust-coloured wall, double openwork wooden doors, the same colour, form a sliding partition opening on to a room dubbed the “restroom”, as it is meant to be followed by an area with a Jacuzzi. Extremely bright with a tall atrium set in the west wall, this room has a red-ochre polished concrete floor and white walls. An opening on the north side leads to the future Jacuzzi. All the plumbing has been laid on. The floor is covered with wide strip wooden flooring with a step leading up to the Jacuzzi. A series of small glazed alcoves on the west wall filters the light, making it an ideal spot for relaxing. 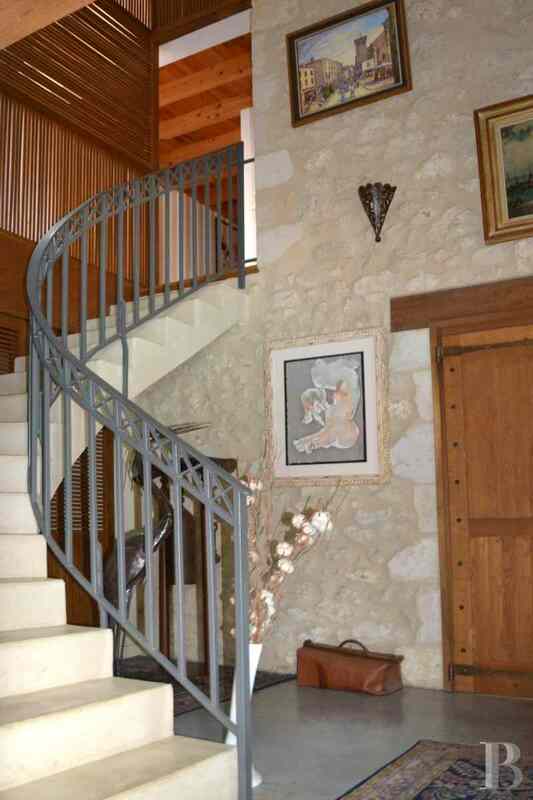 A masonry stairway, at the end of the large workshop room, goes from the restroom to the bedroom area. 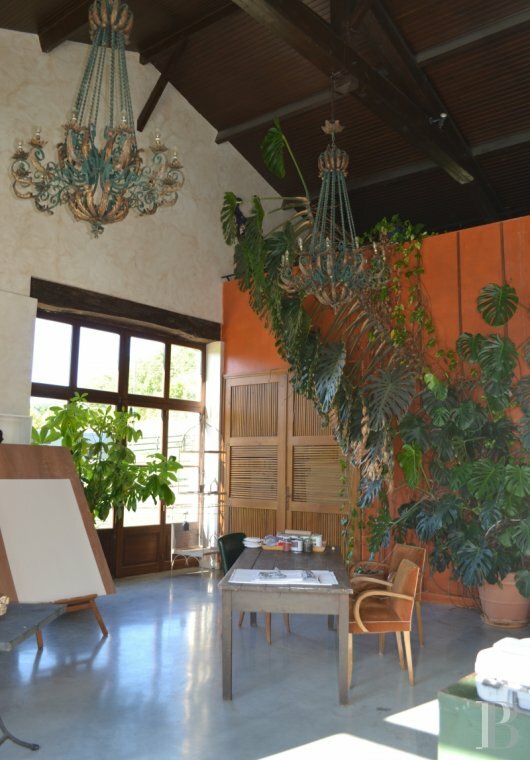 A vast landing with a polished concrete floor and stress painted walls, directly above the Jacuzzi room, looks down on to the artist’s studio, on the ground floor. A low, west-facing window lets in copious amounts of light. And a series of cupboards, painted slate grey, line the room. The second flight of steps goes to an immense master bedroom spanning the same floor surface area as the large lounge below. 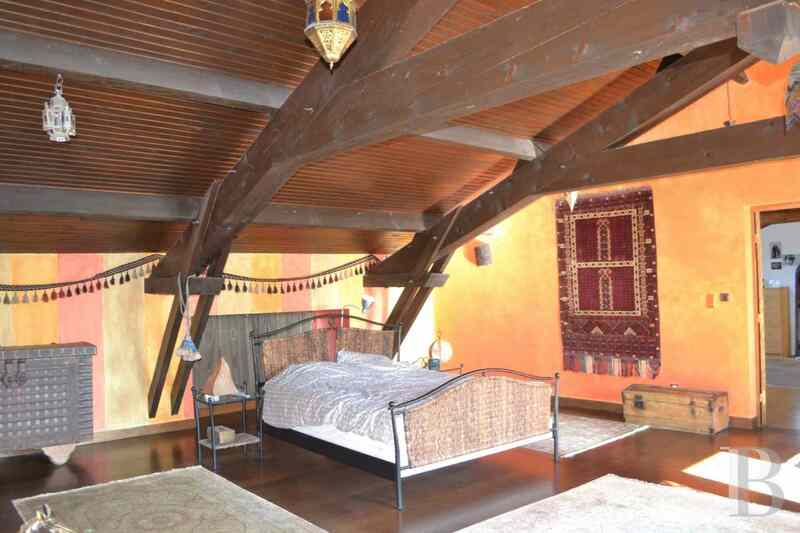 Under the sloping roof, the beams and the wood panelling are varnished a dark brown. The floor is covered with narrow strip pattern dark brown wooden flooring. The walls are painted with acrylic paint in wide strips featuring three tones of yellow, ochre and red-ochre and providing an exotic touch. A sliding, fully glazed partition opens on to the terrace set between two supporting walls, looking down on the swimming pool. A section of this terrace is covered. The floor is laid with dark grey and ochre-coloured, wide stone tiles. This bedroom is decorated in an oriental style. A glazed sliding door on the north side opens into a bathroom with spotlights set in the low ceiling and a red-ochre polished concrete floor. Two wash-hand basins are supported on a wooden cupboard. On the east side, a toilet and an Italians style shower are separated by a partition wall. The floor has the same two tone tiles as the terrace. The dressing room, reached from both the master bedroom and the bathroom, is laid out under the sloping roof. It comprises a series of white cupboards with sliding doors as well as light-coloured sprung parquet flooring. A skylight on the west side lets in copious amounts of light. Next, opening on to the landing of the main stairway coming up from the hall, are four bedrooms: on the west side reached via several steps, two children’s bedrooms with wide strip pattern, light-coloured wooden flooring. The flat ceiling is white like the walls. A square window is on the west side. A cupboard on the north wall houses all the plumbing for the underfloor heating. Two bedrooms follow one on from the other on the east side. The first has a small mezzanine reached via an open wooden stairway. The truss in the plaster ceiling is exposed. 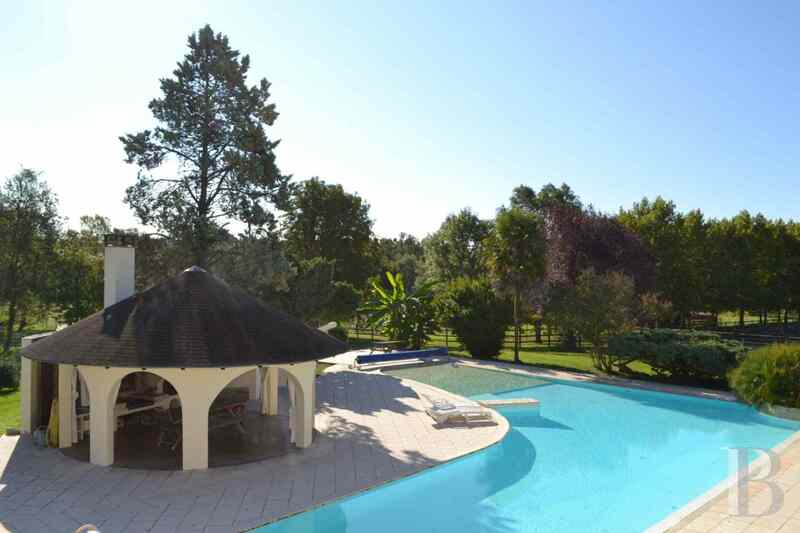 It has light-coloured wood parquet flooring and two small, square windows with a view over the swimming pool. The second bedroom has similar windows, floor and ceiling. But it also has an alcove created by a wall set at right angles on the left-hand side on entering the room. A wooden roof has been added, with bamboo blinds, thus creating the effect of a small cabin. The communal bathroom is at the end of the corridor, reached via a flight of steps. The floor is covered with yellow and white tiles just like the outside of the bath and the wall above the wash-hand basin. There is a separate toilet. At the end of the corridor, a ceiling hatch provides access to the attic. The entire house has underfloor heating, which can be reversed and used as air-conditioning during the hot summers. This old wine storehouse has been transformed into an office and a house. The central through section has two large picture windows on the north and south sides. There are light beige floor tiles throughout the house; the truss is exposed with resonance-proof plaster panels between the beams, much appreciated in a working environment. A large wood-burning stove stands against the east wall. On the east side, a step down and separated from the central section by a counter, is a kitchen with a sink set in the angle formed by the tiled counter and the kitchen range set at right angles. Two small-paned windows and a large French window face south, looking out over the paved terrace which separates the wine storehouse from the main house. 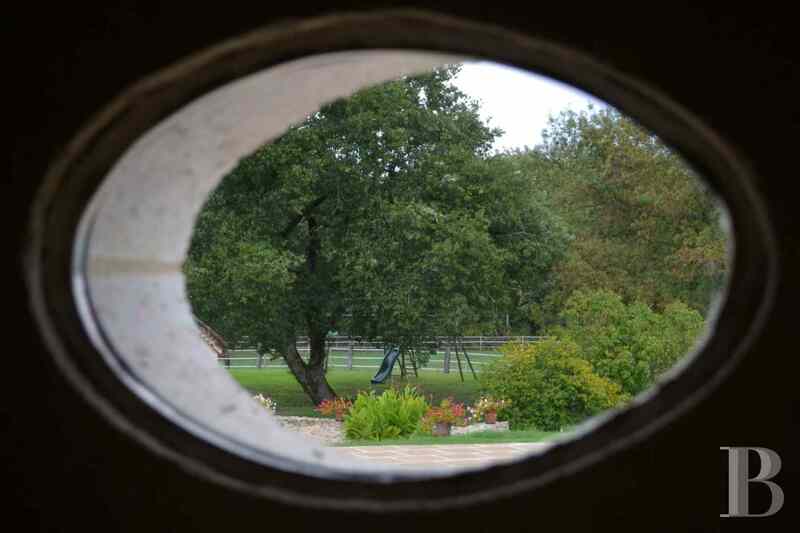 Then comes a storeroom and, at the end of the corridor, a French window, opening, on the north side, on to a covered terrace which can also be reached from the central section via a French window. On the west side, behind a wooden partition running the length of the living room, is a cupboard housing the heating controls. Next, a door opens into a bedroom with a flat, white-painted ceiling, white walls and a small west-facing window. 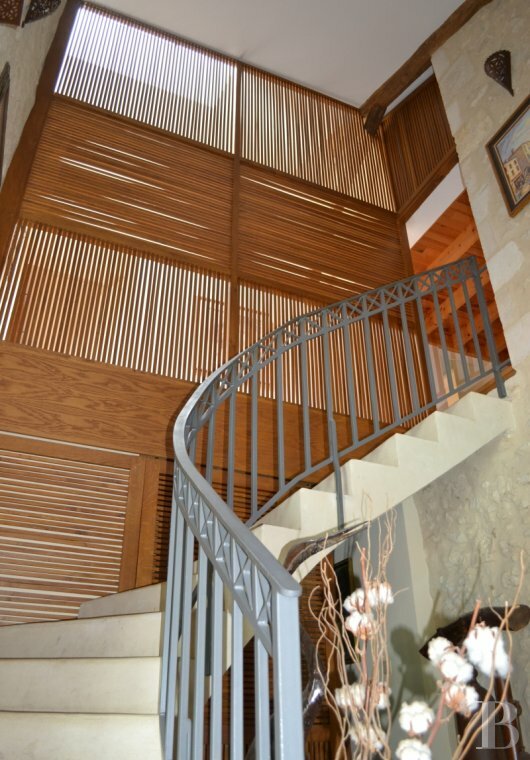 In the middle of the wooden partition, a second passageway goes to two bedrooms and a bathroom reached via a corridor. 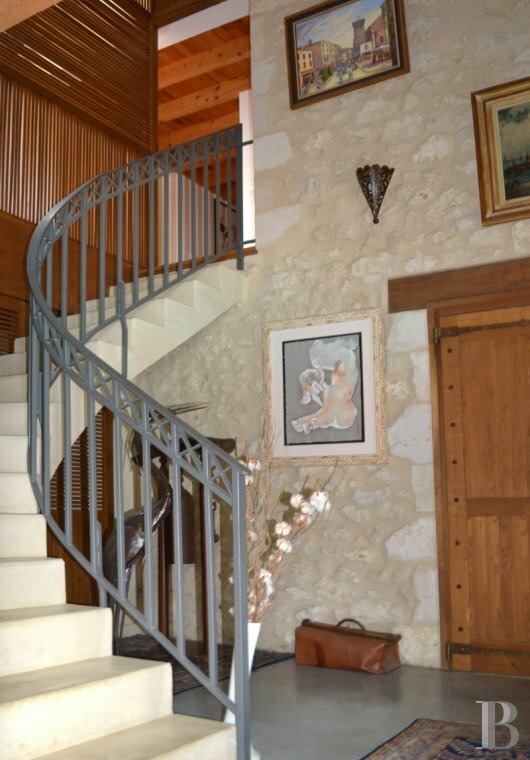 Backing on to the last bedroom is the stairway providing access to the mezzanine running along the west wall. 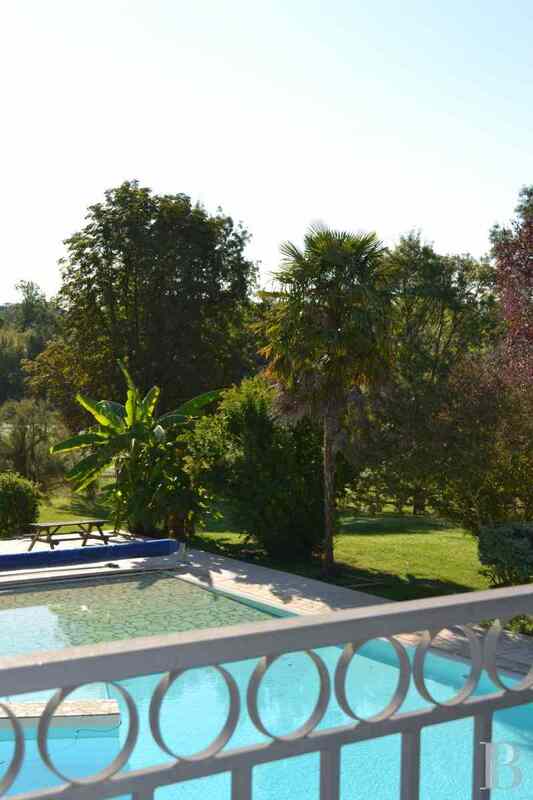 Near to the main house, on the east side but separated from it by a paved terrace, is a large L-shaped swimming pool. It ends with a deck covered with a few centimetres of water where it is pleasant to sunbathe. A section next to this forms a bubble bath. 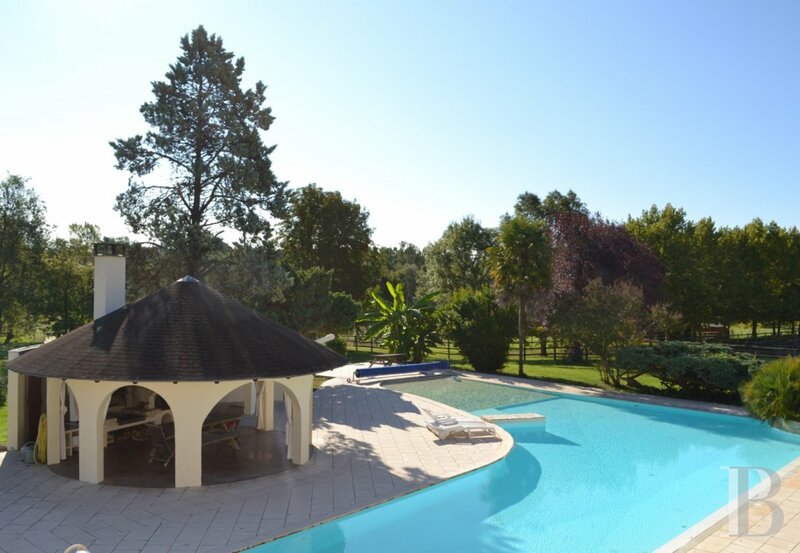 On the other side of the swimming pool, facing the house, a gazebo with its masonry pillars and its dome resembles an African hut or summerhouse. This is an ideal spot for eating relaxed meals courtesy of its tall barbecue at the back. 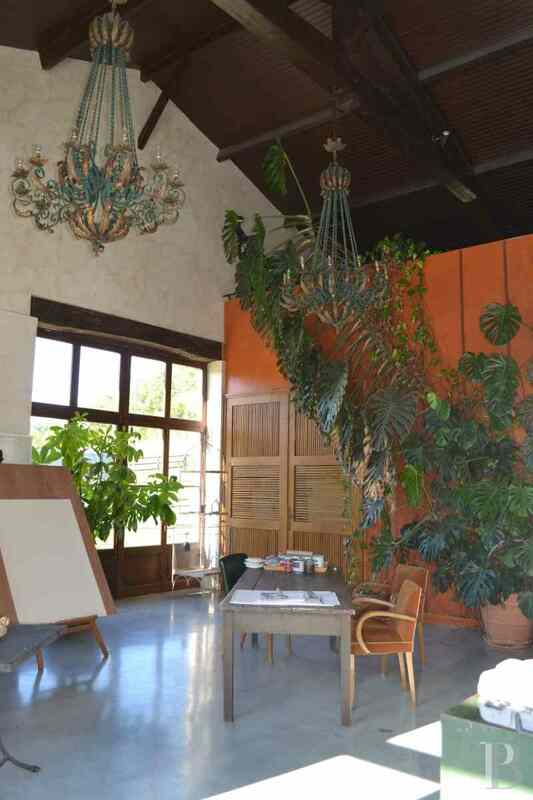 The garages and the artist’s studio are laid out in a building on the north side, separated from the house by a paved terrace, itself half-covered by an atrium, ready to ward off any rain. 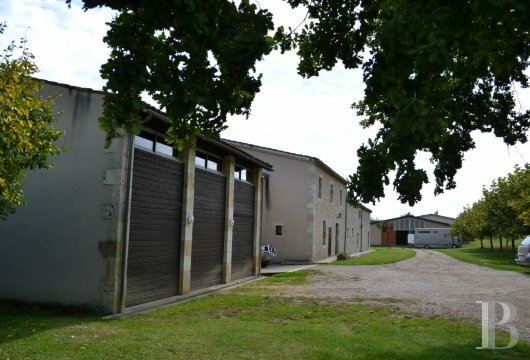 The 28 m² sculpture studio adjoins the garages. It opens, on the east side, via a very large, artist’s workshop style atrium, stretching from the floor up to the ceiling. 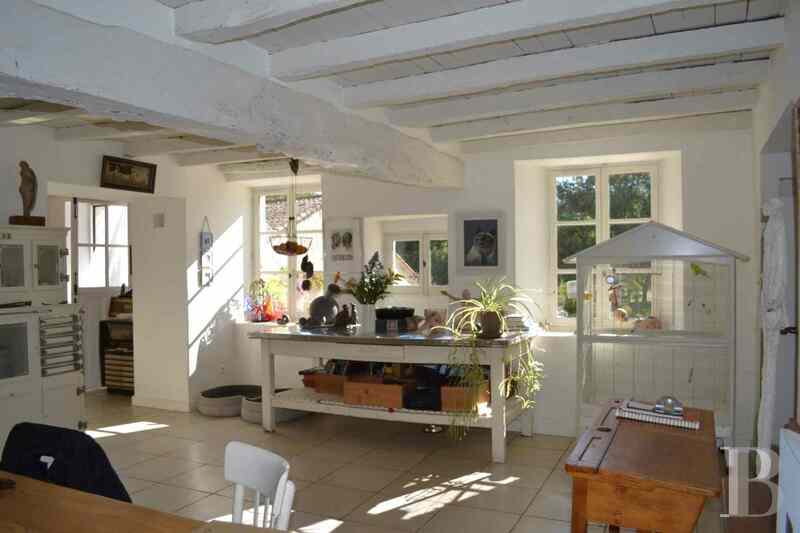 It has white walls, a flat plaster ceiling and a sink on the north wall. On the west side, a straight stone stairway goes to the garage level with its 46 m² cement floor able to take three cars. 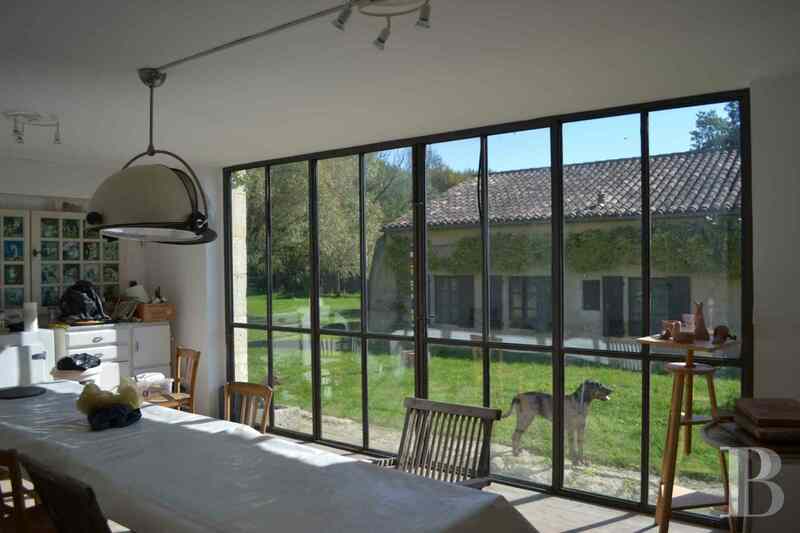 Above the artist’s studio, a studio flat spanning the same floor surface area, faces east via atrium windows. It has light beige floor tiles, a separate bathroom with a shower and a wash-hand basin as well as a separate toilet. A few more steps lead, directly above the garage, to a large 46 m² dormitory, with light-coloured floor tiles laid out under a light-coloured wooden truss. It also has two long sliding windows on the west side and a large window overlooking the stairwell. The walls are painted with acrylic paint in wide light-ochre and red-ochre strips. The bedroom is divided into two sections comprising a large living room on entering and at the end, behind the truss forming an alcove, a dormitory section which resembles a large cabin! A bathroom, two wash-hand basins and a shower, with a separate toilet. The top of the stairs features a glazed, north-facing partition looking out over the garden. A raised farm shed, standing on a small hillock, is constructed from breeze blocks. Its south and east facades are covered with sober planking imitating the openings in tobacco drying sheds. It has an Everite roof. On the east side, a large workshop room, spanning approx. 30 m², communicates on the west side with the farm shed section where all the farming equipment such as tractors, horse boxes and round hay bales are stored. Above, a flat area reached via a stone stairway is used as storage space. The covered surface area, spanning approx. 240 m², is open on the west side. An old construction, with a well, below the garage, resembles a small guardhouse. The stables are reached on the north side via a large carriage door. The roof is insulated with sheets of heat-reflecting rock wool. 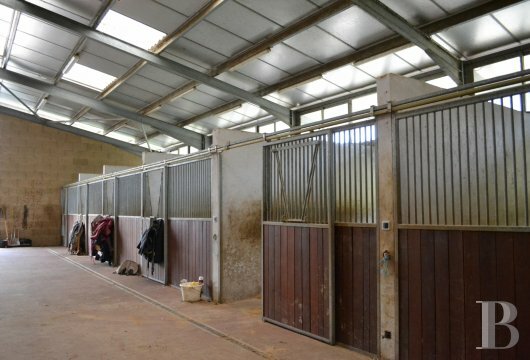 A wide, central, through passageway provides access to nine horse loose boxes, two loose boxes for ponies which can be converted into a single foaling stall as well as treatment rooms. All the horse loose boxes are fitted with an automatic feeding system and, on the side with six horse loose boxes, the floor is covered with a rubberized flooring to prevent the horses slipping. 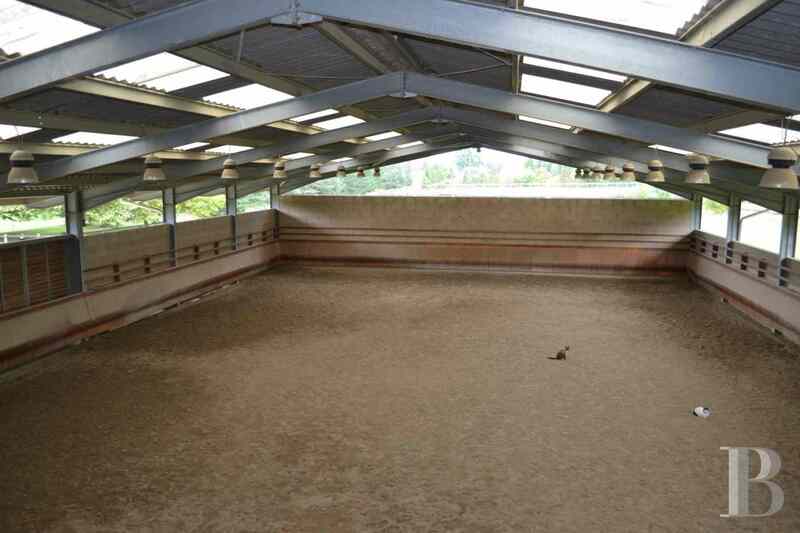 Next, a storage attic followed by a shower room and sundeck for the horses. A masonry stairway precedes the tack room which communicates with the boiler room and provides access to a flat spanning approx. 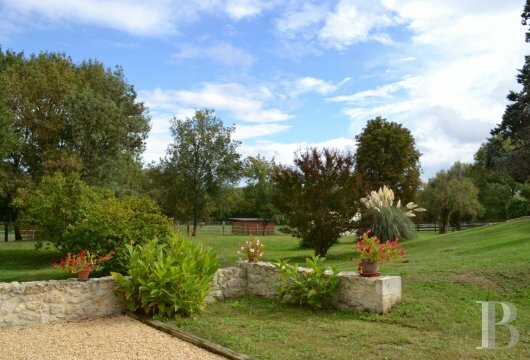 90 m² comprising a 45 m² living room with an open-plan kitchen, two bedrooms and a bathroom. An outside stairway leads from the main room to the meadows for the horses. 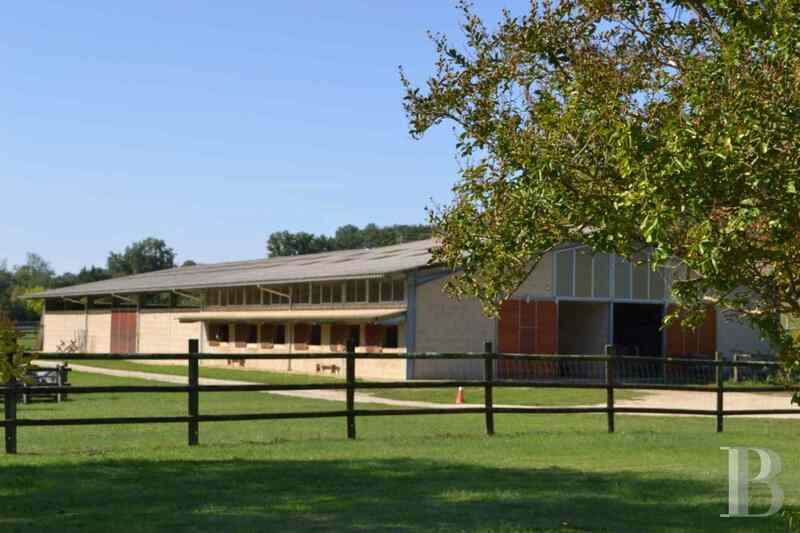 The large central corridor leads to the covered riding arena, at the end of this building. A large floor surface area spanning 600 m², the floor is covered with sand and the arena is fitted with a kick board. The lighting is installed so as not to cast any shadows. An outside dressage ring faces the stables on the other side of the lane. 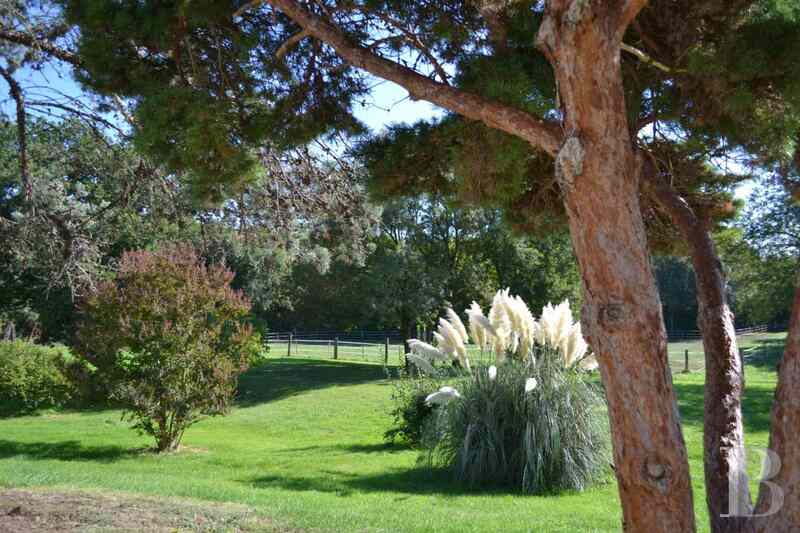 The well-being of humans has not been sacrificed for that of the horses who are particularly pampered here and who will show their appreciation when trekking through the gently undulating countryside. 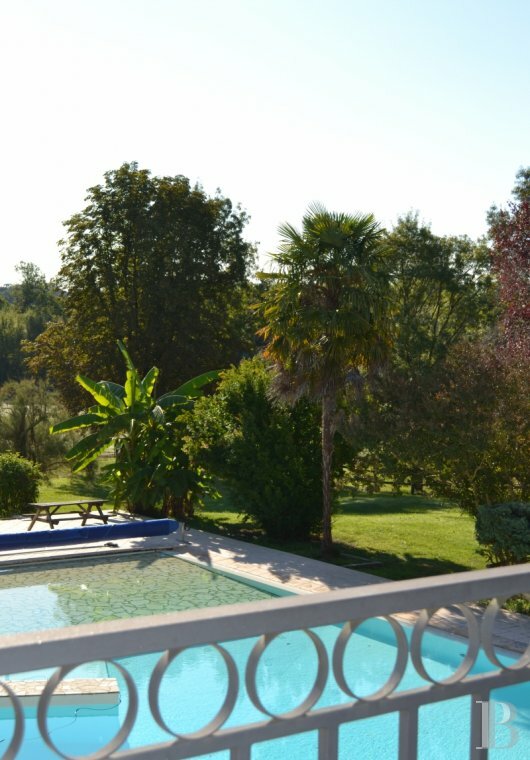 New owners and their guests will benefit from an exceptionally large swimming pool, from a daring use of light on the insides, from a subtle blend of old materials with pure contemporary lines and from an inventive use of colours throughout the rooms. 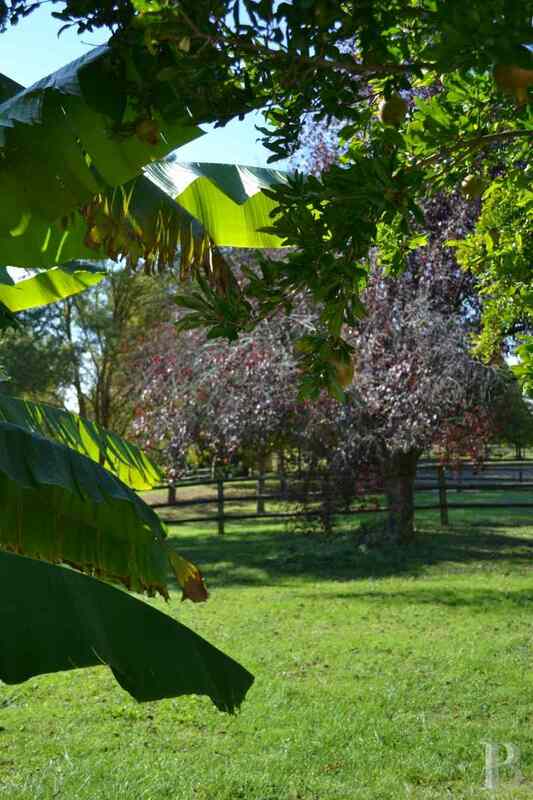 Happiness is to be found here for man and beasts alike both in the meadows and under the trees.